Samsung's betting big on, well, big, as the South Korean company looks to be focusing on large, 5- to 6-inch smartphones and even bigger tablets, with sizes of up to 20 inches expected. G4Games is reporting that during its quarterly earnings conference call Samsung's Executive Director, Hyunjoon Kim, revealed the company's big plans. Samsung led the phablet charge with the Galaxy Note back in 2011 and it's still the market leader in that space, so it's no wonder the company is planning to focus on that area. But 20-inch tablets is another matter altogether, as they'll almost certainly be a fairly niche product, though we've recently seen Samsung edge in this direction with the 12.2-inch Galaxy Note Pro. 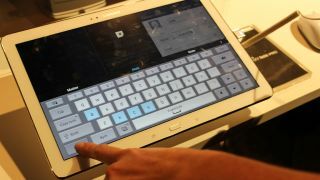 Kim stated that these giant devices will be a new tablet category and that the slates will have high resolution screens. There's certainly a market for such things but we'd be surprised if they fly off the shelves. He also stated that the company will be producing various tablets which will be modified versions of the Galaxy Tab, as if the market wasn't already flooded with enough different Samsung tablets. Finally, Kim reiterated that the company will be improving the screen sensitivity of its devices, which will allow for the likes of improved Air Gestures. Don't want to wait for the new raft of phablets? The Samsung Galaxy Note 3 is out now.